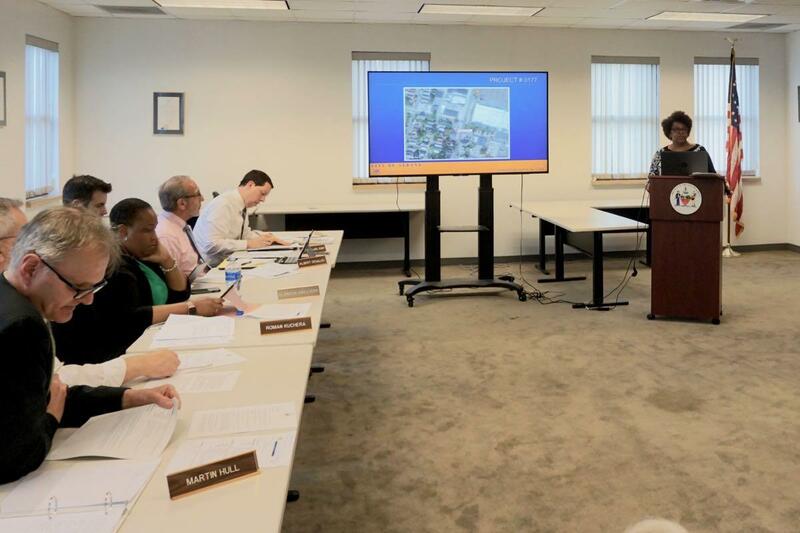 The planning board meeting opened with something a little different, a public hearing about a proposed to changed to the city's new zoning code to include "use-specific standards" for blood plasma centers and methadone dispensaries. + Blood plasma collection centers don't fit neatly into any existing category in the zoning code, so adding the use -- with rules -- would clear that up. (Some background: A national plasma collection company has been eyeing a space at the Hannaford Plaza on Central Ave to potentially open a collection center, and the lack of a category for the center was an issue.) The standard would require a 250-foot distance from nearby residential areas or institutions such as churches and schools. Spencer said that distance was based on consulting the standards that other municipalities have for plasma collection centers (he said some don't have any distance requirements). + Methadone dispensaries are currently grouped with marijuana dispensaries under the category of "Controlled Substance Dispensary" -- but the two types of facilities have different neighborhood impacts. Spencer said the proposed standards address some issues that the city has already encountered with methadone facilities, including a requirement for a designated drop-off area to avoid problems with double parking. A conditional use permit would also cap the number of monthly visits. If the number of visits in two consecutive months exceeded that limit, the dispensary would have to apply for a new permit with a higher cap. The new designation for methadone standards didn't seem to prompt much concern from the board or public commenters. But the blood plasma center did. Common Council member Judy Doesschate spoke during the public comment period to basically ask a bunch of questions about licensing of these sorts of facilities (she was formerly an attorney for the state Department of Health). And she wanted to know more about potential impacts on nearby residential areas and businesses such as the ones at Hannaford Plaza. Fellow council member Michael O'Brien was the other speaker (Hannaford Plaza is in his ward). And he was irked. O'Brien said that the standards he originally saw in November for plasma centers included a 1,000-foot distance. And he told the board he hadn't been notified of the change, learning of it just then -- and called the situation a "bait and switch." (The planning department memo about the new standards that's posted in the city's online project file store is dated April 17.) He said the distance requirement should be kept at 1,000 feet. Chris Spencer responded that the planning department's research didn't indicate that such a distance was warranted. The board ultimately voted 4-0* to pass along to the Common Council a positive recommendation on the methadone dispensary standards. And it tabled a recommendation on the plasma center standards so there could be further discussion. * Board member Christopher Ellis was absent. 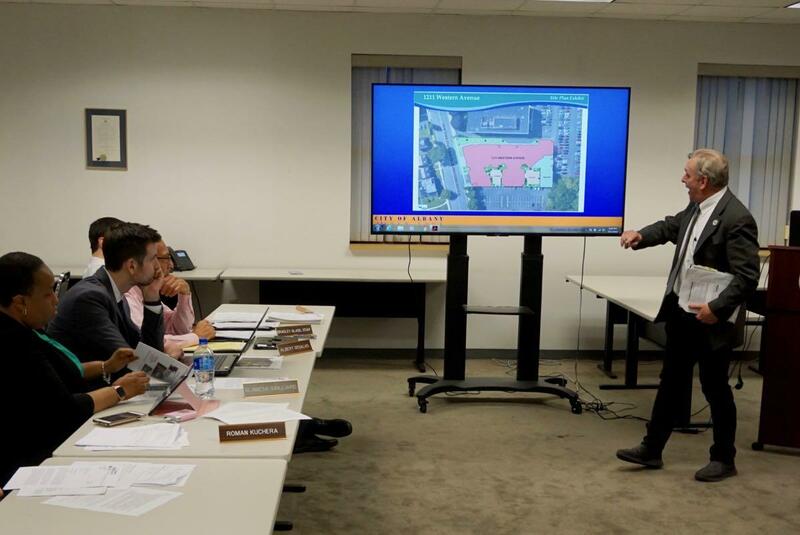 The proposal from the Kipp Tech Valley Charter School to build an expansion on Northern Boulevard was back up before the board. The school is adding elementary grades and expects to grow from 200 to 470 students by 2021. The purpose of this appearance was largely to get demolition approval for a handful of properties adjacent to the school. Engineer Dan Hershberg of Hershberg & Hershberg -- because it can't be a planning board meeting without Dan Hershberg -- explained that KIPP wants to be able to do demolition and parking lot work during the summer when students aren't around, thus the request for the demolition permit ahead of approval for the overall plan. During the public comment period, Julie Lundgren -- a resident of the Melrose neighborhood and frequent speaker in favor of preservation -- said she opposed the demolition of the former residences, arguing it would hurt the fabric of the neighborhood. (A KIPP official said at a previous meeting the buildings were vacant when the school acquired them.) "The school should not be in the business of destroying the neighborhood that it serves," she said. The board voted 4-0 to approve demolition. 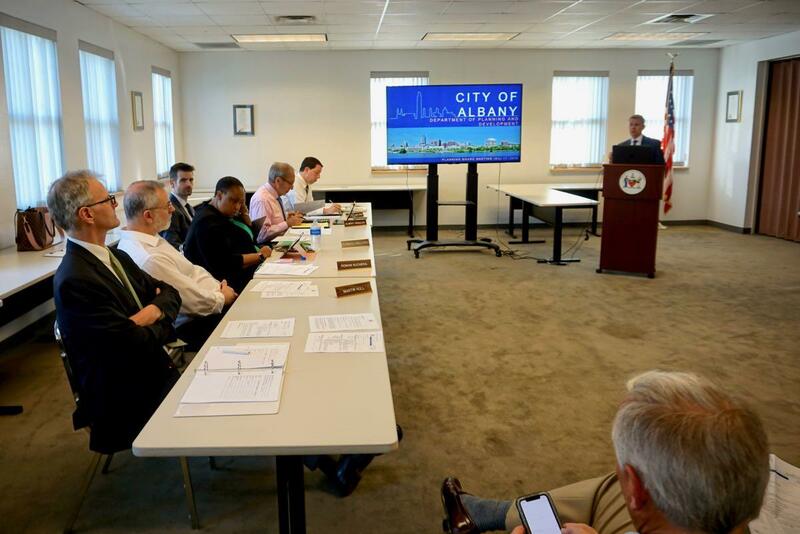 The public hearing portion of the meeting also included a request from Shannon McLaughlin for a special use permit to operate a funeral home in an old post office building at 1226 Broadway in North Albany. Engineer Bill Smart walked through an overview of the project, noting the chapel of the funeral home would seat about 70 people. The plan includes 14 parking spots on site, but Smart said there was a "significant" amount of on-street parking, especially just to the north. And in conversation with the board, Shannon McLaughlin said the funeral home would mainly hold wakes during the evening, when many of the nearby businesses aren't using the on-street parking. During the public comment period, Christina Godfrey of nearby North Street, said traffic along Broadway is difficult during rush hour, and "we literally take our lives into our hands" when making turns. Godfrey said she though the funeral home would require more parking. Though she mainly seemed annoyed about traffic engineering. "Give us a damn traffic light, we need it." Carolyn McLaughlin addressing the board. But McLaughlin's application also got support during public comments from Common Council member Joyce Love, who criticized "all the bickering about the parking" during the meeting and argued both the funeral home and its patrons would be able to adapt. Former Common Council president Carolyn McLaughlin -- Shannon McLaughlin's aunt -- also spoke in favor of the project "This is an opportunity for us to grow small business in the city of Albany." And the project got support from another member of the family, Herbert McLaughlin. Ahead of the board's vote, chair Al DeSalvo said he's been to many funeral homes in the area that were in dense neighborhoods -- many of them had small parking lots and it didn't seem to be an issue. "My personal opinion is that the use here is a good one." The board voted 4-0 in favor of the permit. Regan Development's proposal to build a new 5-story, mixed-use building with retail, offices, and 71 apartments on the site of demolished old Albany Police Department building on Central Ave near Manning Blvd has multiple appearances before the board since it was first introduced back in October. And Thursday it made one more. Jamie Easton of MJ Engineering was back to quickly recap the project. He noted that Whitney Young Health would be occupying space on the street level, with Equinox offices on the second floor, and the apartments behind there. He also recapped the flow of vehicles and pedestrians through the site, particularly the one-way right-only driveway leading out to Manning that had been the subject of much neighborhood concern. There was little board discussion and no public comments. And ahead of the vote Easton said the developers were willing to add speed humps to the driveway and would be open to some sort of gate in the future if requested. The board voted 3-0 in favor of development plan approval, with the stipulations for the speed bumps and gate. Glinessa Gaillard recused herself because she's on the board of Whitney Young. 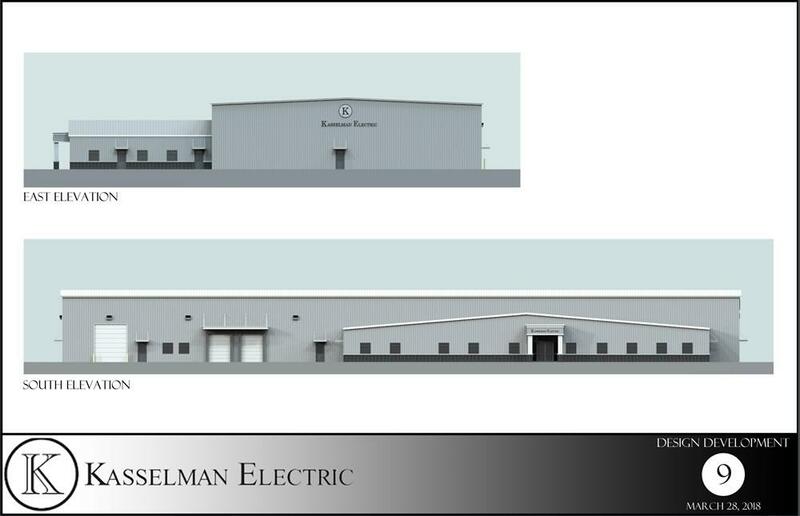 The electrical contractor Kasselman Electric is proposing to building a new office/warehouse facility on land currently owned by the Port of Albany between South Pearl Street and the Normans Kill. (The company is currently on Morton Ave.) This was the project's first time up in a regular board meeting. 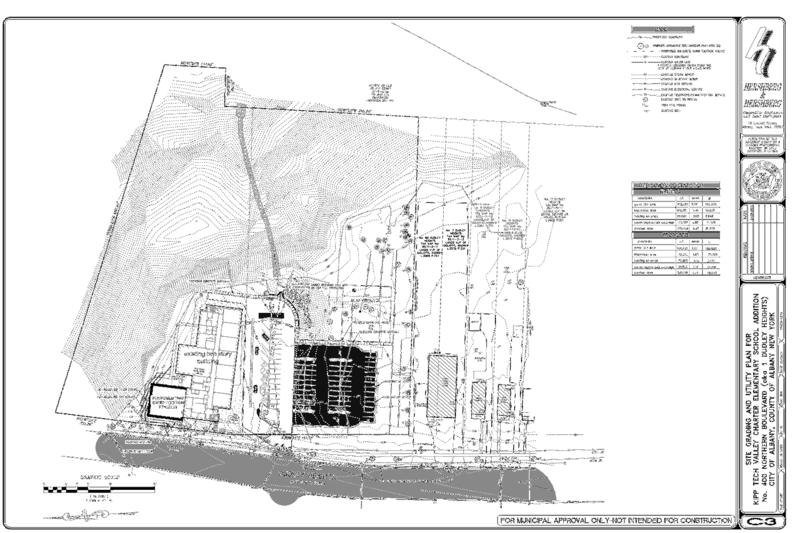 Dan Hershberg walked through the outline of the plan, explaining that Kasselman would be pursuing the project in stages -- the office space with one warehouse and parking lot first, and then the second warehouse space in the future. He said the facility wouldn't include a showroom and would generally not be open to the public. A traffic study is on the way. There was some discussion with the board about the location near the Normans Kill, grading, and wetlands. Hershberg said the wetland areas on site weren't protected, and he talked about some of the stormwater planning. The appearance was mainly an overview. The project will be back. There was a packed house for Thursday's planning board meeting and many of the people were there for this project. 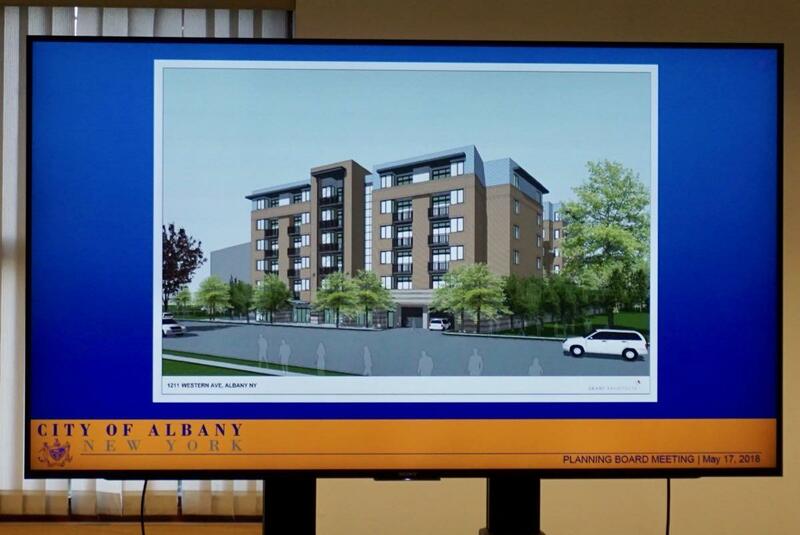 GSX Ventures is proposing to build a six-story, 137-unit apartment building on Western Ave near the uptown UAlbany campus and the University Plaza shopping strip. There would be 115 parking spaces under the building. An existing 12,000-square-foot office building would be demolished to make way for it. + Attorney Andy Brick said the developers would be complying with the city's new inclusionary zoning requirement. That would make it, by our count, the first project to do so. + The three-story section -- lowered because of its proximity to an adjacent single-family, low-density zone -- would have a green roof. + Engineer Wendy Holsberger told the board the project would generate a net increase of 31 trips during the morning peak hour and 45 in the afternoon peak hour. And the site will operate adequately without a traffic signal. + DeSalvo was skeptical that 137 units would result in the relatively low number of trips predicted in the traffic report. "People are going to use their cars," he said. "I don't believe these numbers." Holsberger, the engineer, said the forecasts are based on industry-accepted models and that trip generation often can seem counterintuitive. + Andy Brick, the attorney, said the team was looking at ways of adding more parking spaces, which Brad Glass said would be helpful. Brick said efforts to secure spots on adjacent property had been unsuccessful. Then it was on to public comments, and there were many. Eight nearby residents spoke, as did an attorney representing the adjacent commercial property owner, along with Common Council member Tom Hoey. Tom Hoey addressing the board. The comments from residents echoed many of the issues raised in the past, with concerns about density, the height of the building, traffic, parking, construction noise, and impacts on sewer infrastructure. An overriding theme was a sense that this project would degrade the quality of life in the neighborhood. 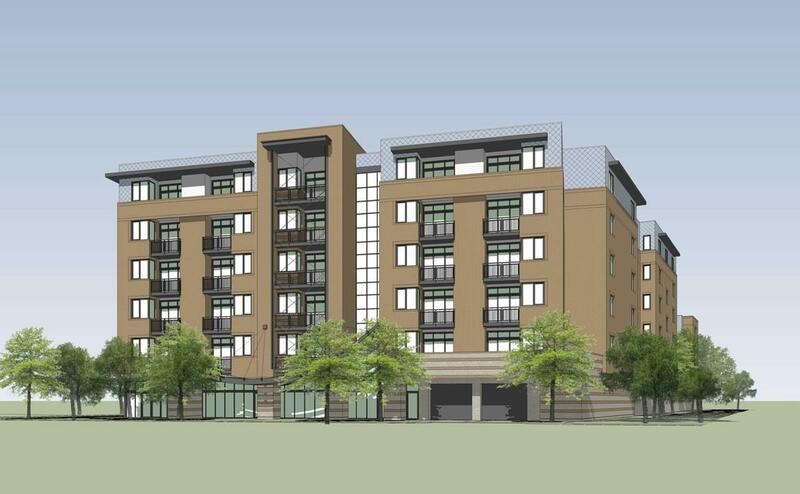 As one resident, Juliet Turner, described it, the apartment project would "constitute a taking of our way of life." Christopher Langlois, an attorney representing adjacent commercial property owners, raised concern about emergency vehicle access to the rear of the site, which could require passing through property not owned by the project, as well as turns off Western Ave given the lack of a turn lane. And Common Council member Tom Hoey made an impassioned presentation that reiterated what many of the residents had said, argued the new project was basically the same as the previous project, and framed the situation as a fight between local neighborhood residents and a wealthy out-of-town developer. (Hoey referred to GSX founder Jon Grant as "Baltimore Jon.") Hoey's speech elicited applause from people in the crowd. Thursday's meeting was the first time up for this iteration of the project, so the board didn't take any action. And as Al DeSalvo said, there will be many items to address the next time it's up. Rehabilitation Support Services (RSS) is proposing to build a three-story, 20-unit apartment building on a series of vacant lots starting at 104 Clinton Ave (near Hawk Street) in Arbor Hill/Sheridan Hollow. RSS describes the project as affordable housing. Then things took a bit of an odd turn. Charles Dumas, the attorney representing the project, told the board that RSS was in the running for a competitive grant to fund a portion of the $5 million project, and the deadline is approaching deadline. He said that having the city's approval for the project would earn the RSS application a higher score. And then he requested the board take action to issue some sort of approval then and there. Getting a project approved during its first appearance before the board would be very unusual. Also, based on comments from city staff, it might not even be legal given the administrative intricacies of the State Environmental Quality Review Act (SEQR). But Dumas pressed the case, leading to a few tense moments of back and forth. The board ultimately agreed that it would be willing to convene a special meeting to consider the project ahead of the next regularly scheduled meeting. A little bit wider context for this project: Back in February RSS got approval to construct three new residences for people with substance abuse and addiction issues on Second Street in West Hill. That project was the culmination of a multi-year process that included a legal fight with the city and complaints from residents that the neighborhood was being unfairly saturated with facilities of that type. 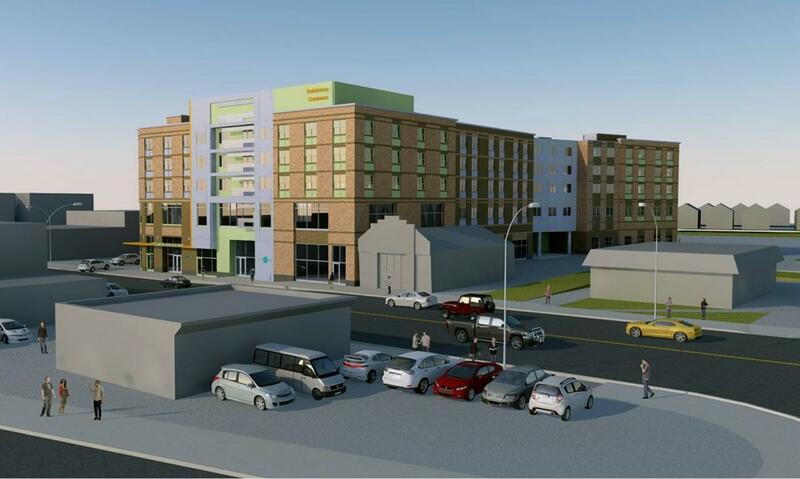 During the presentation to the board Thursday, Charles Dumas described the Clinton Ave project as "supportive housing for people re-entering society from sort of difficulty." 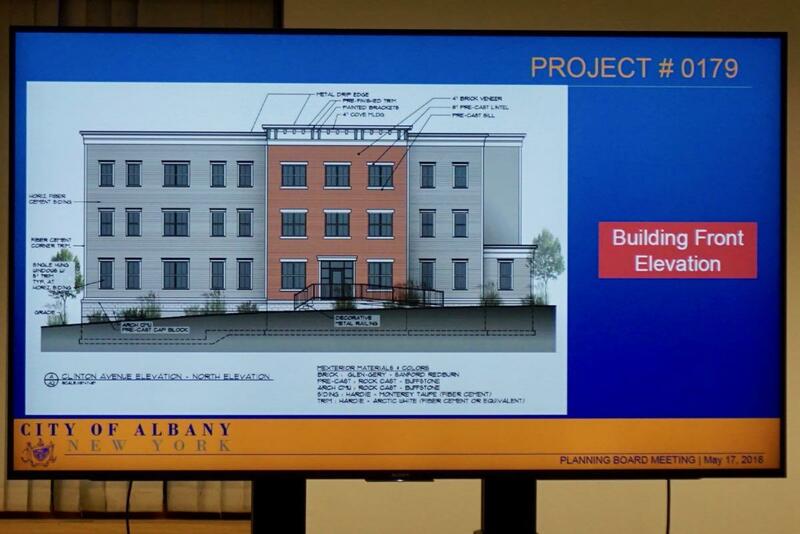 After the presentation we spoke with RSS executive director William DeVita, who said the project would be "supportive housing for low-income individuals" and would primarily serve people from the city of Albany. He said it would be open to people with incomes at or below 30 percent of the area media income. The board voted 3-0 to declare itself the lead agency on the project for the purposes of SEQR. Glinessa Gaillard abstained because she lives near the site. Al DeSalvo said that wasn't necessary because she doesn't have a direct connection to the project, but she said it was the prudent choice. I'm either confused -- or very naïve -- about the blood plasma collection center. I've donated plasma (apheresis) many times at the Red Cross on Everett Rd. Is the "collection center" slated for Central Ave. to pay people for their plasma (thus not located in tony Loudonville)? I have to admit I only know about the sell your blood thing by reading about it. So what is the issue with the 250 (or 1000) ft. distance from residences, schools, or churches? I mean, it's plasma needed to save lives, whether donated or sold. This seems like class bias about the folks opening up their veins for this purpose. I'm super confused about the blood plasma center too. People are *for* a methadone clinic but *against* a plasma donation center? Huh? "I'm either confused -- or very naïve -- about the blood plasma collection center. I've donated plasma"
You may have donated blood. I don't think you made an actual plasma donation. Anyway yeah, what's the issue? @ stan -- I absolutely know what I have donated at the Red Cross. Sometimes I have donated whole blood, but because my blood type is AB+ my plasma is much needed. AB plasma is the universal plasma type (can be given to anyone) and only 4% of people have AB blood. The blood is collected in the usual way, but the plasma is separated in a machine right next to me and the red cells and platelets returned to my body through the IV. It's a longer process than the usual 15 min. whole blood donation.